How to get started with this amazing outdoor sport. This article originally appeared on TheOutbound.com. Written by Stephen Underhay. Photo by Lindsay Daniels. Rock climbing is an amazing and invigorating hobby. Its culture promotes hard work, patience and humility – values that translate to many other outdoor adventures and life in general. Rock climbing can be intimidating with all the gear, inherent risk, and expertise needed to know where to climb and how to do it safely. With that said, rock climbing is actually a very laid back, fun, and community driven activity that just about anybody can get outside and do. The first step with any new activity is to do some research to get beyond your surface impression to see if you’re actually interested in it. Read into the different kinds of gear: the basics being shoes, harness, rope. The advanced being protection and anchors. Check out this list of essential gear for beginner climbers. Learn about top roping (a well-controlled and relatively safe climbing style for beginners) and the inherent risks involved with the sport. If you’re still stoked on starting to climb, read on! Want to learn more skills to help you better enjoy the great outdoors? Attend one of the CamelBak Pursuit Series weekends–three-day escapes near Salt Lake City (August 11-13, 2017) and San Francisco (September 8-11, 2017) with customizable itineraries including sessions on everything from wilderness survival to family camp cooking to smartphone photography. Get your tickets at pursuit.theoutbound.com, and use promo code PURSUIT100 for $100 off your three-day pass. The next step involves starting to get introduced to the intricacies of climbing. Meeting people at the local climbing gym will offer great opportunity for advice and tips. Hiring a guide or taking lessons will offer you a more formal way to gain knowledge in this sport as well. Learning about being safe: putting on and double checking your gear, tying knots and using carabineers, how anchor systems work- is the most important to having a long climbing career. 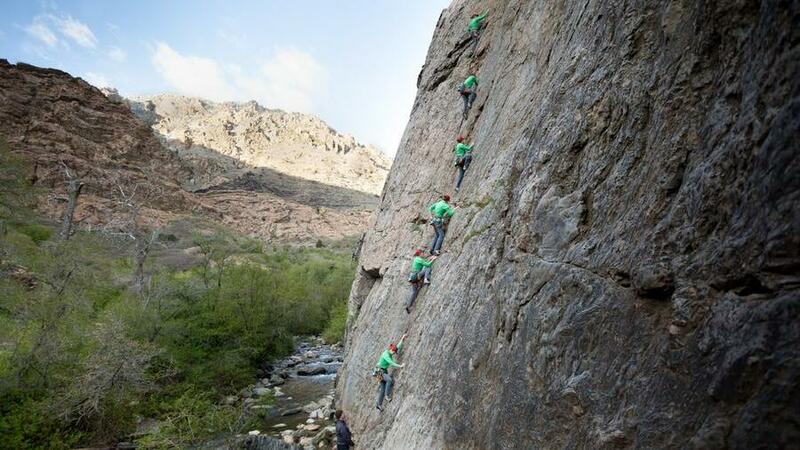 Meeting experienced and knowledgeable climbers will help you get an understanding of best practices and etiquette. As with any new sport, you’ll initially have a steep learning curve to overcome. Training will help you with these challenges and aid you in becoming a more efficient and proficient climber. And what’s the best type of training for this? Doing it! Getting out to the climbing gym as often as you can provides a relatively safe and controlled environment for getting the basics down and building the strength and endurance you’ll need. Next, understand that climbing is as largely about mental fortitude as physical strength. It’s an intimate sport with your only support lying with yourself and on the other end of the rope. Developing an ability to manage your fear (of heights and falling – two very basic and very real instincts) make the difference between being energized by the adrenaline rush or paralyzed by it. This will come with experience and time in the sport. There’s a natural routine that climbers develop as they learn new skills and want to push themselves. Routes are graded based on difficulty, so the more comfortable you become the further up the grading system you can move. Once you’ve got a grasp on top roping (a climbing style that involves the rope anchored above you) you can move to more advanced styles such as sport climbing (clipping into steel anchors bolted on the route with the rope trailing below you), traditional or “trad” climbing (using passive/active protection you place and remove throughout the climb) and multi-pitch climbing (several rope-length routes in succession). Climbing requires immense patience and confidence, so move slowly! Finally, something that can set you apart from other newcomers is a firm understanding of the culture of rock climbing. The lifestyle is unique and ever changing. From the misfits of Yosemite in it’s early days to the extreme athletes like Alex Honnold and Tommy Caldwell today, the activity is gaining popularity and a foothold in mainstream media. Talking with experienced climbers and keeping an eye on the latest feats of top members will help you understand the lifestyle of this amazing sport. Climbers routinely stack up against some of Mother Nature’s most iconic marvels and attempt, not to beat it, but to coexist with it for a short amount of time. Developing this attitude of humility and respect will help you gain critical insight to the mental aspect of such a demanding sport. This is merely the tip of the iceberg to the worldly knowledge of climbers long before me. There are many avenues of research available to further your understanding of this passionate sport. Hopefully this article inspires you to rope up and head to the crag!